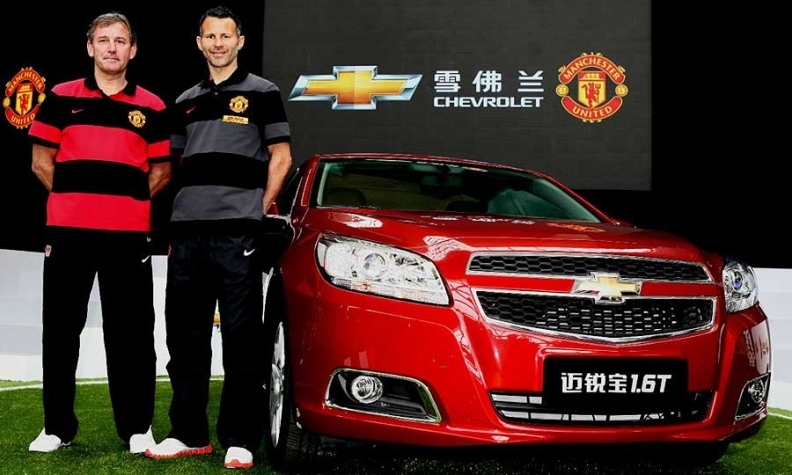 Former Manchester United captain Bryan Robson, left, with veteran player Ryan Giggs in Shanghai, China, along with a Chevrolet Malibu. DETROIT -- General Motors Co., after ditching costly Super Bowl ads, is betting a five-year sponsorship of the Manchester United soccer club will bolster its Chevrolet line in the first test of the brand's new global marketing strategy. Manchester United, the 19-time English champion football team, has a worldwide reach that fits with the automaker's desire to make Chevrolet a global icon. "As Chevrolet continues to grow as a global brand, this is the right time to make a commitment and establish a presence in international football," GM Global Chief Marketing Officer Joel Ewanick said in a statement today. "Our ambition is to connect with football in a fashion that transcends traditional sponsorship. We want to bring to life the deep appreciation we have for the game by celebrating the best that football has to offer and introducing uncommon opportunities for fans to immerse themselves in the game." Under the deal, Chevrolet logos will appear on Manchester’s bench and players’ sideline chairs. The deal also includes in-stadium advertising and player-endorsement opportunities, a GM spokesman said. The Chevrolet logo won’t appear on Manchester’s jerseys, though. That space is reserved for the team’s main sponsor, insurance company Aon Corp.
At a news conference at GM’s headquarters, Ewanick called the investment in the sponsorship “significant” but wouldn’t disclose financial terms. Ewanick said the tie-in with Manchester offers an exposure opportunity unmatched by any U.S. sports franchise. He said there are an estimated 3.5 billion soccer fans worldwide -- half of the world’s population -- vs. about 400 million people who follow the National Football League. Manchester sells more team jerseys than all 32 NFL teams combined, Ewanick said. He said he expects the sponsorship to have the biggest impact in China, where Manchester has more fans than in Europe. Ewanick called the deal the start of a strategy to forge more soccer partnerships globally and that he’s looking for opportunities for other sports sponsorships as well. “This is really … an indication of how we are looking at marketing globally for Chevrolet," he said. "This is just the beginning of how we’re going to enhance that footprint everywhere,” he said. He said both U.S. and overseas Chevrolet dealers will be able to use the Manchester United logo with GM’s permission. The Machester sponsorship, combined with GM’s decision this month to not advertise during the 2013 Super Bowl, should not be seen as a sign that Chevrolet is shifting its focus and ad dollars away from the United States as it seeks to grow internationally, Ewanick said. He noted that Chevrolet remains the largest advertiser on NFL games and that he expects to increase spending on the NFL. “We’re not going to spend less on North America. We’re going to spend more,” he said. The Manchester deal comes as GM seeks to accelerate Chevy sales in Europe and globally. Last month, GM said Chevrolet's first-quarter sales hit 1.2 million worldwide, a quarterly record and a 7 percent jump from a year earlier. In 2011, Chevrolet sold a record 4.76 million cars and light trucks worldwide. The moves are among the first steps of Ewanick's efforts to revamp the Chevrolet's marketing with a new global agency and save $2 billion over five years. CEO Dan Akerson wants to make Chevrolet and Cadillac into global brands, less dependent on the U.S. market. While Chevy is known in the U.S. for its brawny trucks and Corvette sports car, many Chevrolets sold in Asia and Europe are smaller vehicles designed and engineered in South Korea. That's why GM is working to craft a more global message for the brand that can be tailored for many markets, said Alan Baum, principal of auto-industry forecaster Baum & Associates in suburban Detroit. "Now that they feel reasonably comfortable about the product, how can we leverage that?" he said, describing the company's thinking. "It's going to take a little bit of time and look a little messy." Sponsoring Manchester United emerged from Ewanick's decision to shift all Chevrolet advertising to a newly formed agency called Commonwealth, Edwards said. That firm, a joint venture between Omnicom Group Inc.'s Goodby, Silverstein & Partners and Interpublic Group of Companies Inc.'s McCann Erickson, replaces 70 agencies that had worked on the Chevrolet business, the company has said. Ewanick's aim is to focus on effective spending. More than 20 television ads, he said, were created to promote the Chevrolet Cruze compact car around the world when only a half- dozen were really needed. "Every penny matters," Ewanick said in an interview with Bloomberg earlier this year. "It may seem like a little thing you do in Thailand. But if you take that little thing in Thailand, a little thing in Brazil, a little thing in Germany and France and you add it up, it becomes a big thing." The Chevrolet experiment could serve as an example for Cadillac, Ewanick said. "This model is one that definitely will be pursued by every global brand," Ewanick said. GM declined to say how much the Manchester United sponsorship will cost. It allows Chevy signage in Manchester United's stadium and access to the team for TV, print and other media for use worldwide. Manchester United games are broadcast in 1.15 billion homes, 80 percent of the world's households with televisions, according to GM. In August, shipper DHL Worldwide Express paid Manchester United, also known as Man U, 40 million pounds ($62 million) for the right to put its logo on the team's training apparel for four years. Aon pays 20 million pounds a year to put its logo on competition jerseys.